Best location on the French Riviera. Bright and beautiful apartment with all the amenities right in the thick of it. Ideally located in the old town, round the corner from the flower market and a few hundred meters away from the Promenade, this stylish apartment offers all the modern comfort for a memorable stay. A stroll away from numerous restaurants, bars and traditional local shops, the beautiful Place Massena and the Coulée Verte, a green heaven in the city, it is the perfect pied à terre for an enjoyable experience. The apartment is situated on the second floor of an historic building that once served as a covenant and hospital. Ideal for a family of four. However, there is a sofa bed that can offer one additional sleeping place. 4 meter ceilings, in floor heating, 100% LED lighting, built in LAN, 51' flat screen LED TV, WIFI, Apple TV, dual docking station for iPhone 4s and older devices. WASHER/DRYER, dish washer, oven, microwave, induction stove top, glass shower, solid oak flooring and Italian tiles. There are two full sized beds in the mezzanine area with sofa sleeper in the living area. There is also a large beautiful bathroom with in-floor heating and an Italian style shower on the main level, just below the loft. Bright and clean, spacious and comfortable, it really is the best location in town and ideally situated if you are looking to make day trips in the area. A few minutes walk to the upscale shopping in Carre d'Or. Under a minute walk to the independently owned shops of the old town. Steps to the outdoor flower market on the Cour Saleya. Plus, the beach and the Promenade are very nearby . More restaurants than you could visit in a year. Grocery stores, boulangerie, dry cleaners are all within walking distance. Airport shuttle and tram to the train station are just steps away. There are also buses to Monaco and Cannes within a few minutes walk. from the flat. Also, there are a couple of Auto Bleu car stations nearby. The electric cars are a great way to explore. They only cost 8 euros an hour and give you 120 kilometres of autonomy. There are four separate velo bleu bike stations under a few minutes walk .The bicycles are free for the first 30 minutes and one 1 euro an hour after that. All buses and trams cost just 1.5 euro. So if you would like to enjoy the beaches just outside or head to Cannes, Antibes, Juan Les Pins, Monaco and more, this flat truly puts you right in the centre of all the action. Large bathroom is located on the main level directly below the loft, with Italian style shower, in-floor heating and hair dryer. Freshly laundered towels are provided to every guest. Fitted sheet, top sheet, pillow cases, blankets and duvet. This is not included in the cost of the rental. There is a parking garage just across the street from the flat. Currently priced at €23 per day. Coffee, tea, sugar, salt, pepper, oil. Fully equipped with dryer, washing machine, dish washer, microwave, oven, 3 ring stove top, refrigerator/freezer. The apartment has a dining table and four chairs. However, we do have two addition matching chairs in our storage room for groups of five or six. We enjoyed our stay in Nice and couldn’t have asked for a more perfect location! It was great to be so close to the restaurants, market, Beach, and access to trams. Karine was great to work with from the very beginning when I booked and throughout our stay. She was responsive within minutes to a few of our inquiries of her. The apartment itself was nice and clean and had everything one could want. It should be noted that there are a lot of stairs to get to the apartment and then steep stairs in the apartment to the sleeping loft. I’m sure it wouldn’t bother most younger people, but it was a little tough for a couple senior citizens - especially climbing down to use the toilet a few times at night. There was some major construction occurring in the hallway - perhaps a lift? I would definitely recommend the apartment to others that are younger and more in shape. Thank you Karine for sharing your apartment with us and thank Julienne for carrying our heavy bags up two flights! Thank you Laurie for your positive feedback and your useful comment regarding the stairs. In order to solve the problem, I have asked a professional to slightly elevate the steps and cover them with a non-skid carpet. I have posted a picture of the new flight of stairs in the photo gallery. 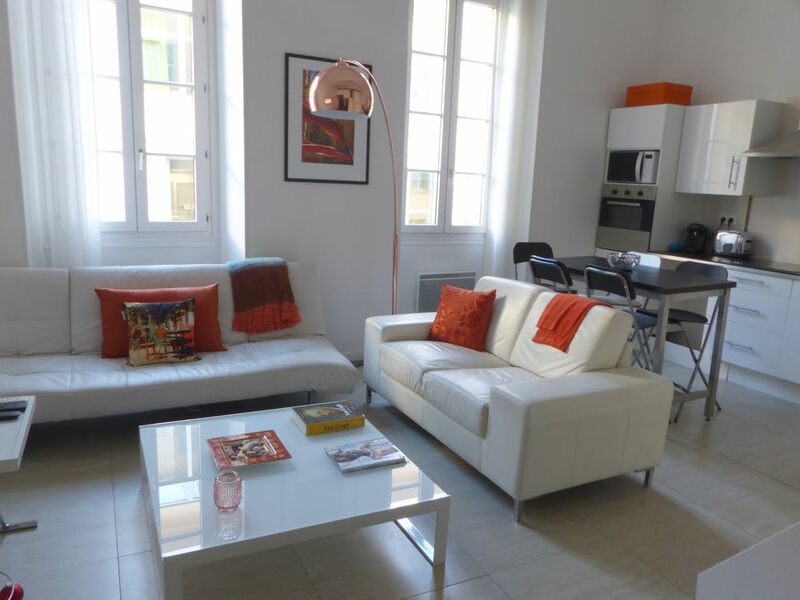 Nice appartment well placed at the classic old center of Nice 3min from the Promenade des Anglais and the beaches. Well served in the matter of transports to visit other cities like Saint Paul de Vence. We had a great time and we absolutely recommend this appartment. Hands down, the absolute best place to stay in Nice! Im not even sure what to highlight first because everything about this stay exceeded our expectations. The apartment was gorgeous. Clean, tasteful, comfortable and spacious enough for a family with three teenagers to relax. The apartment was equipped with everything you might need including a beach umbrella, mat and inflatables. Perfect for the beach which is literally two minutes down the street. You are absolutely in the heart of the best part of Nice but certainly not noisy. The boulangerie that is at the corner had amazing croissants and baguettes which we had every morning g and there were other markets close by as well. We had a rental car and the parking garage was a two minute walk as well. We felt safe and were sad to leave such a wonderful place!We would absolutely stay here again and recommend it to anytime also traveling to Mice. Thank you! The property was clean, modern and well located. It was easy to find and Karine went out of her way to arrange the key hand off. We would stay there again. Air conditioning and washer and dryer were appreciated and needed. Best location in the Côte d'Azur. Located directly between Carre d'Or and Old town everything Nice has to offer is right outside the front door. In addition, the loft is located perfectly for excursions to neighbouring cities. Public transportation is just around the corner. Plus, there are several car rental agencies in the neighbourhood. Also, bike and boat rental agencies are very near by. Rates are subject to change until reservation has been made. A €300 refundable cash security deposit is due at check-in. Our house rules are established to prevent inconsideration and not to arbitrarily charge guests at every turn. Come see why we have received over 200 five star reviews between our two flat. Parking is available at an extra cost. If you are interested in securing a parking place please let us know at time of booking and we can included it in our quote.